Belmont Auto Repair - 5 Star Auto Service Inc. Excellent repair service for my Mini thermostat replacement. So happy to have found 5 Star auto service. Thank you! 5 Star customer service shuttle provides convenient and easy pick up and drop off transportation to and from our facility! Auto Repair in Belmont 5 Star Auto Service! When Belmont drivers need auto repair, they turn to the team of auto mechanics at 5 Star Auto Service. From a fun-sized MINI to a sturdy Dodge pickup, we will get your vehicle performing at its best. You can expect us to go above and beyond by providing your vehicle with top-notch repair and providing you and your family with respectful and trustworthy customer service. At 5 Star Auto Service, we recognize how much you rely on your vehicle. Picking up your daughter from her soccer game, getting to that morning meeting on time, or racing to the grocery store for the forgotten item, are just a few of your daily tasks on your hectic schedule. Your schedule is already busy enough. When your vehicle is in need of auto repair, it seems as if your to-do list got that much longer and your stress levels skyrocket. When you bring your car to 5 Star Auto Service, we go the extra mile to address your concerns and ease your worries. Each member of our auto repair shop team, lives near Belmont and understands the value of hard work. Our family has worked many years in the automotive industry to secure a solid reputation for excellence in the San Francisco Bay Area. 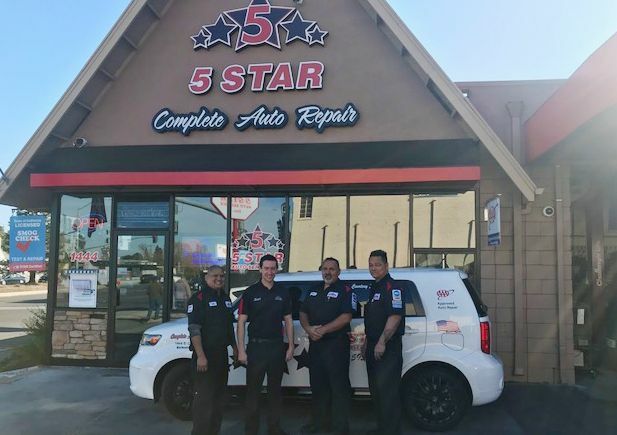 When you choose 5 Star Auto Service for an auto repair, you’ll see our dedication to excellence, our desire to create a positive customer service experience, and deep caring for the customers and the cars we service. Our calling in life is to provide the best quality auto repair to drivers in the Belmont area. Our auto mechanics are ASE-Certified Master and ASE-Certified technicians. 5 Star Auto Service is an ASE Blue Seal-Certified facility, along with being a Napa Auto Care Center and ACDelco shop. We are AAA approved and even part of the Costco Automotive Program. If you are a Costco member, you can receive 15%. These certifications and memberships are a testament to the caliber of the service and repair we offer at 5 Star Auto Service. your vehice and making it as good as new!